"Early October," I said. It was the end of September. "You sure you want to count your chickens like that?" The kitchen had just been gutted to the studs, and the biggest point of progress was that it now had a floor. The anticipated finish date was Friday, September 27. When we started the project, our anticipated completion date was end of the summer. We were both cautiously optimistic, but also highly skeptical, that we'd hit the deadline. "I don't care!" I was perkier than usual. I hardly ever use exclamation points when I talk. "It'll be done. Or it'll be done enough. I don't want to put off having a social life waiting for the kitchen to be 'perfect.' Nothing in life is perfect. No one expects things to be perfect. If we put it off because the kitchen may not be finished, then we'll put it off again and again... 'because we don't have the right furniture,' 'because it's too cold and no one wants to come to Queens when it snows,' 'because our budget is too tight to buy dinner for six people.'" I stopped. Our budget was too tight to make dinner for six people. "It'll be tapas. That's so inexpensive. And we'll make it pot-luck style. Everyone can bring something. We'll make tortilla, which is basically just eggs, and little pinxons, a big salad, a loaf of bread. Someone will bring wine. People always bring wine. We'll buy two or three bottles. It'll be fun!" "Okay," Boyfriend said. "I support you." That phrase is code for, "Seeing as you're going to do it anyway, let me remind you that I'm on your team, but you are steering this ship, not me." On Thursday, September 26, the kitchen workers told me that they realized one of the cabinets was the wrong size. "We'll rush order a new one, but it's going to take two weeks." "I've waited long enough, I can wait two more weeks for a cabinet," I said. On Friday, September 27, Boyfriend and I got an email saying the tile we picked for the backsplash had only just that day shipped. It would arrive October 3. I called the contractor, who called the tile installation guy, who said he'd have to take a look at his schedule. On Friday, October 5, we had our friends over for dinner anyway. 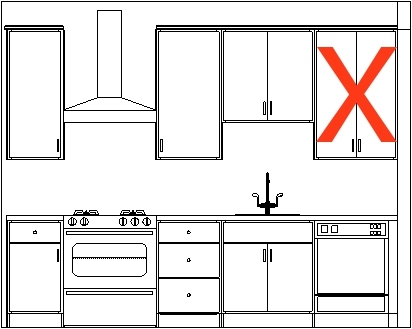 The kitchen had one big empty space where a cupboard should have been. the entire back wall behind the sink and counters was bare. Two boxes of tile sat in the dining room. And you know what? I don't think anyone minded. We fired up some shishito peppers (all the Padróns were finished for the season) and left a few huge wedges of cheese on the table with some baguette. We cut fat triangles of tortilla and let it hang out at room temperature. Someone spilled an entire glass of wine that sloshed all over the floor and up the wall, and someone else caught the wine glass miraculously before it smashed on the ground. Sometimes friends or family will talk about how they want to travel or have children or taking some other step in life, followed by, "But first I'm going to wait until..." "we have more time," "I make more money," "things finally settle down with..."
And it never happens. It never gets easier. No one ever has the right amount of money or the right amount of time. Sometimes you have to just shut up and charge forward with "enough." Otherwise, you'll put it off forever. Our kitchen still isn't painted (we got as far as priming and picking a color, then got sidetracked by more important matters) and we still need to spackle over a couple of nail holes. But it's all done in the sense that I don't have to worry about the little things, like nail holes and paint, any more. It's done "enough."